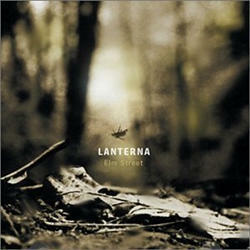 This past weekend, during coding, I opened last.fm and clicked on ‘My Recommendations’ and a short while later ‘B Minor’ from the 2001 album ‘Elm Street’ by Lanterna started playing from my speakers. The track is captivating, its ambience, smooth and flowing — so different to many ‘guitar-based’ tracks out there, while at the same time more interesting sonically from the ‘electronic’ equivalents. It took little time after this before I visited 7Digital and bought the album in mp3 format. The album, twelve instrumental pop-rock tracks featuring acoustic and — in general — clean electric guitars, strings and pads as well as playful basslines and up-beat drums is perfect material for those times when music needs to be subtle, yet more than just sonic wallpaper. The music is hard to pinpoint, somewhere betweeen post-rock and shoegaze with a strong element of pop making it easy on the ears, yet at the same time more than your archetypal commercial variety. The ‘band’ released a few more albums, since Elm Street came out. I’ll certainly be looking for them in the near future. I looked for them on LastFM. I can’t say that I was amazed but I liked them. I see that you have an interested in music. I’m from Sicily actually. My mother. There was this band (1985-1995) in Sicily, called “Kunsertu”. They have a couple of songs that are widelly known as masterpieces among the Italian music society. This band it was the first really “ethnic” band, mixing ethnic sounds from Sicily, Arab countries and instruments from the other Mediterranean countreis (Not Greece as far as I can tell though). They have a MySpace profile. Unfortunatelly I couldn’t find all of their albums in the iTunes music store and amazon-mp3 is only available in the USA, although I’m not sure if are available more than one albums there also. You can take glue at their Myspace address. Try “Ghandura” and “Mokarta”.